I have made fresh mod, repeated steps, compiled without issues, but it still crashes the same as before when i place the building on the map. I have attached archive of the mod and source file of the meshes for transparency. It works fine and smooth. I'm going to adjust some other maps and attempt to make mod with more than one building in it. I like these little log houses with wooden roofs! I am wanting such buildings for my game. One that is a larger size would be splendid, like double the length. It is wonderful to see more people are learning how to mod. Modeling these log houses is time-consuming, given how you can't let down details and how many polygons you have to unwrap and adjust to avoid patterns repeating too much. Thanks so much for posting this tutorial... I just want to say.. Holy WOW this is hard!! I can't believe how long it's taking me to do anything, and I've only just managed to get up to the first row of horizontal beams. LOL! at our experience, it can take us from 4 hrs to 16 hrs of works to us to depending the complexity and details we want to add. I want to say thanks for the tutorial too. It helped me a lot with getting things done in Blender. I also had no experience in modding games or making anything 3d apart from in a CAD program back in school 15yrs earlier. And that didn't include any texturing. I wrote this back when I started as a way for myself to learn and hopefully get others to follow. Back then it took me days to do something basic. And I'm not kidding when I say I spent months before just looking at and trying to get a grip with blender to just do those basics, learning some of the keyboard shortcuts makes all the difference in blender I think. 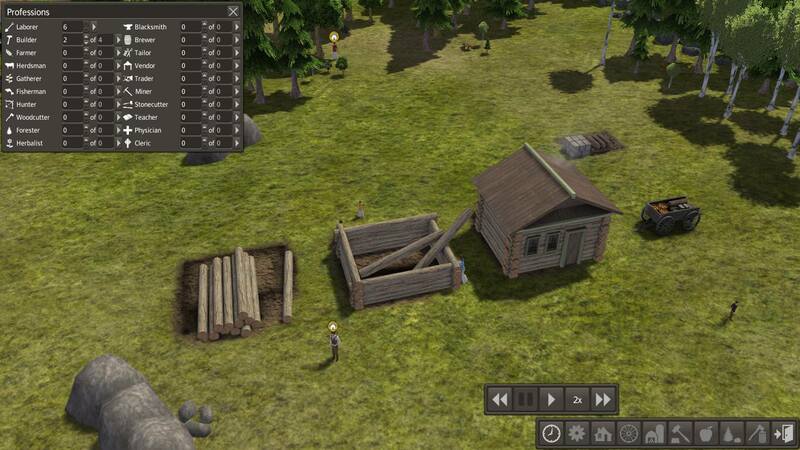 I started by making a tree, and no way could I get that thing in banished... or any game. Don't even want to say how many faces it has. I also now texture as I make the 3d model, it is nicer to do, allows more experimentation with details I think. For a while I did unwrap the models so each plane had it's own place on the UV, but now I overlap quite a bit and re-use same parts of textures, and yes mirror them also sometimes. basic code to get a model in the game can be quick once you get the hang of it : 10-15min. but once you start getting into it more and experimenting with different code and UI, things slow down. For example the last week i have been updating mostly only the UI of the styth tower mod, I've added a few other models but at the most the 3d modelling/texturing has contributed to maybe 2-3% of the time spent on it. I've spent I think over 48hrs so far on it. Assert: Source resource 'C:\Users\kraso\Desktop\BanishedKit\MyMods\Slav\Models\MaterialInstance\Pit_House.rsc' does not exist, and compiled resource not found in pack! I have been brushing my files to find any reference to this path, to fix it, but it's not present there. Warning: Source resource 'C:\Users\kraso\Desktop\BanishedKit\MyMods\Slav\Models\MaterialInstance\Pit_House.rsc' does not exist, and compiled resource not found in pack! I haven't found any file which has link to this rsc file in my mod. I don't know what's going on. You must provide the material file for that link. Check your model if it is really in use. Else delete it.